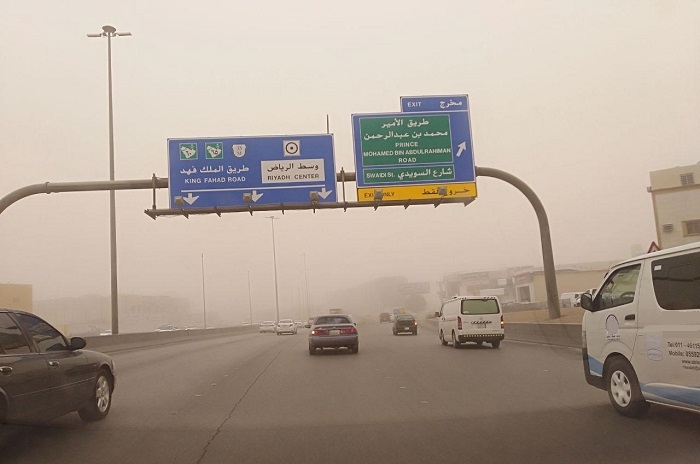 Massive dust storm lashed Riyadh city and its suburbs in the late afternoon on Monday,rendering traffic snarls due to low visibility on the roads. Media spokesman for Civil Defense in the region, Major Mohammed Al-Hammadi, has urged the citizens and residents to take precautions, follow the appropriate medical instructions for respiratory system patients and reduce mobility on roads that are witnessing severe dust storm. The inclement has also affected some parts of the Al-Qassim region located in the north of Riyadh. The traffic police have detailed their patrol cars to monitor the movement of traffic during the storm. Motorists have been advised to exercise extra precaution during the period to avoid inconvenience to other road users. The Police asked motorists to exercise more caution by leaving sufficient distance between vehicles to cope with the low visibility caused by the dusty winds . The Ministry of Health has already issued a warning to people who have respiratory problems to stay indoors to keep away from dust. The hospitals have been instructed to treat patients with respiratory problems on an emergency basis. “ As I was finishing my lunch my wife told me it is getting darkened and it looks as if it is going to rain. Keyed up to face the situation I stepped out to see the entire city was blanketed with dust storm. Visibility was limited to just four to five meters only. I put on my headlights and drew at a speed of not more than 40 km. There were occasions I was compelled to use the hazard light too. The trip to my office in exit 17 in Al Faisaliah district took little more than 50 minutes which under normal circumstances takes only 25 minutes. When night falls, I am afraid, situation could worsen for my trip back home to Sulaimaniah,” an executive who works for a private firm, S.H.Moulana said here on Monday. Omar, a young Saudi driver said that he was driving at snail’s speed because of very low visibility. “ I could not see the vehicle in front of me unless it was on a distress signal,” he said. Dr. Zakir Hussein, medical practitioner in a private clinic advised people to avoid going out of their homes during dust storm. “ Anyone who has respiratory problems should consult his or her doctor without unwanted delay,” he said , adding that some of them may need nebulizer and inhaler treatment.